Kasem Bundit University is a private university in Thailand. Established in 1987, the university offers academic programs at the graduate and undergraduate levels. Its motto is “Value Virtue and Worthiness”. Founded in 1987 by Mr. Kasem Suwandee, “Kasem Bundit College” consisted of 2 faculties in its first year, the Faculty of Business Administration and the Faculty of Law. 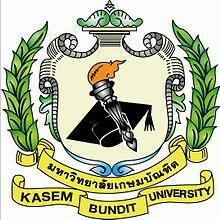 In 1992, Kasem Bundit College was granted permission to become “Kasem Bundit University” by the Office of the Higher Education Commission (Ministry of University Affairs). It added more faculties, and began offering a Master of Business Administration (M.B.A.). The university offers Doctor of Philosophy in Psychology in 2006, Doctor of Philosophy in Public Policy and Management, Master of Business Administration (International Program), Bachelor of Liberal Arts in Thai for Foreigners, Bachelor of Liberal Arts in Psychology, and, with concentration on good health, Bachelor of Sports Management and Recreation Science in 2009. The University vigorously strives to bestow and light up the intellect of prospective students on a path towards a promising future. Additionally, the University steadfastly performs the tasks of serving the nation and communities, with preservation of the national heritage and the construction as well as formulation of bodies of knowledge. The University is destined to produce graduates with Values comprising of knowledge, learning and wisdom in addition to thinking an analytical skills, Virtues comprising of morality, conscience and respects of professional ethics, and Worthiness comprising of dedication to societal development and improvement. To instill students with responsibilities towards the nation, religion, and the monarchy, commitments to support democratic way of governance, devotion to preservation of the national identities and cultural heritages, and respect towards professional ethics of oneself. To further enhance the status of the University of becoming an institute of higher education committed to academic excellence, KBU has been striving to produce graduates with high potentials and excellent capabilities to perform efficiently in both academic-oriented and employment-related situations. Equipped with self-confidence and creative minds to wisely analyze and seek solutions to any problematic situations, the graduates should be able to calmly formulate a problem-solving strategy to counteract effectively. The graduates should also be able to responsibly utilize their own knowledge and experiences to present explanations and solutions to societal enigmas and issues. The graduates should enthusiastically and tirelessly acquire further knowledge relating to their professions as well as open-mindedly make themselves available to any technological changes. To provide education and promote advanced academic quests with commitments to the betterment of the general public; regardless of religious background and socio-economic status. The University is committed to provide equal opportunities for furthering education in the tertiary level among those who finish secondary education who belong to tasks forces of all enterprises. To alleviate the tasks of the government in providing education, and also to take an integral part in the implementation of the government policies of having private sectors partaking roles in providing education and of developing the nation as prescribed by the National Social and Economic Development Plan and the National Education Development Plan. To initiate and organize inquiries and researches as well as to render academic services, and to assist the progress of communities and societies as a whole. The B.B.A. Program is established with an aim to meet the requirements of the global advancement for well-trained personnel in the field of business with a strong background in cultural and linguistics of the global economy. The B.A. in English for Communication Program is committed to developing graduates with English proficiency and skills for global communication. Business Administration (Choose one from the three majors of B.B.A. The International Program in Tourism offers a four-year bachelor’s degree. Its emphasis is not only on class activities, but it also involves practicum and in-depth experience with various and major tourist attractions. This enables the students to select what exactly they are interested in, whether it be tour companies, travel agencies, government tourism organizations or the international tourism organizations. Graduates will be ready for all facets of the tourism industry, locally and/or internationally. Aviation industry has been expanding continually around the world, especially in the Asian Pacific rim. Thailand has planned to be a major Aviation Hub of Asia to respond to the demanded growth. Kasem Bundit University has realized this potential; therefore, the development of the Bachelor of Arts in Airline Management Program plays an important role in producing state-of-the-art aviation and airline resources for students with courses that focus on fundamental airline management and operational skills. Equipped with Check-In and In-Flight mock ups, including a Ticketing and Reservation Training room, the Airline Management Program requires students to complete a 200-hour training program in various airlines and/or organizations related to the airline industry. This prepares students for their future career.